First baseman Mike Mitchell played six seasons in the Yankees, Padres, Cardinals and Diamondbacks organizations. In 544 games he hit .306 with 50 HR and 352 RBI. His best season was 1997, when he hit .350 with 17 HR and 106 RBI for Rancho Cucamonga. Now Vice President at Westlake Risk & Insurance Services in Westlake Village, CA, he kindly answered my questions about baseball cards. First year in pro ball, I was sent to Oneonta New York. We took our team baseball card photos in the first two weeks. One month into the season, I was promoted to Greensboro. I am in instructional league and the baseball cards come out. They have my face on it and Carlos Yedo’s name and information on it. Carlos and I ended up splitting the player cards. My kids will still call me Carlos Yedo sometimes. 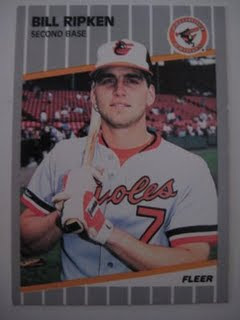 Bill Ripken’s F*** Face card. When I was collecting when I was younger, it was the crown jewel. Yes, but haven’t collected anything new in 20 years. I have an Upper Deck Montana numbered football card that I collected out of a box I bought while working at a batting cage in high school. Thanks! I can't find a picture of that Oneonta card, but here is one from my collection.